All transactions are safe and secure with a reliable history in online purchasing behind each of our associates. 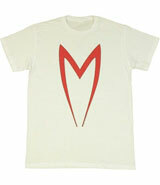 Buy the Speed Racer Mach 5 Logo t-shirt to own Speed Racer clothing and merchandise. The fronts of these Speed Racer t-shirts feature the familiar red 'M' that is visible on the hood of Speed's car, the Mach 5, and on the front of his racing helmet. Racer X also wears a similar but wider 'M' on the front of his costume. Is this a hint toward Racer X's true identity? Wear this shirt under your Speed Racer costume, complete with red neckerchief and helmet. All that you'll need is a full-scale Mach 5 replica, or a Speed Racer diecast car (below). In addition to the Speed Racer Mach 5 Logo tee above, browse the Speed Racer Clothing Gallery for more apparel like men's and women's clothes, kids shirts or hoodies.